There are many who hate. Their disgust for others is hidden by their quietness. It's not tolerance, it's cowardice and insecurity. They lack the confidence in themselves, only erupting in moments where they think they have strength in numbers. The anonymity of the Internet protects them while they douse and let those they are truly not tolerant of have it. This makes them feel powerful in their pitiful worlds. We are upset to see what others have to say on social media and in other forums, but who hasn't uttered in their minds the nastiest things about others? Aren't we sometimes expressing the very same things, but just not in public? But we'll share them with those closest to us who feel the same. Don't certain issues dredge up emotions and expletives, but ones we choose to keep inside? Aren't we truly just as disgusting as they are, but less honest, really? I would posit we are. It's an acceptable form of assholery. People choosing to behave more civilized outwardly to keep chaos and raw brutality to a minimum makes it a more desirable behavior though. When biting our tongues makes us analyze our thought process to establish new streams of understanding, this a positive. It makes our internal vileness tolerable in our communities because it's unspoken and not seen. It won't contribute more to the problems we face, and it is a step towards true civilization and humaneness. 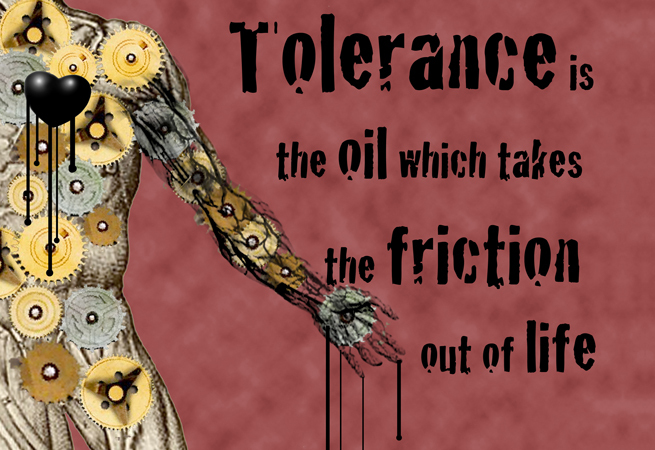 Tolerance is the conduit to enlightenment and harmony. I've been told we'll evolve someday. We are not there yet, but I hope we never stop trying.